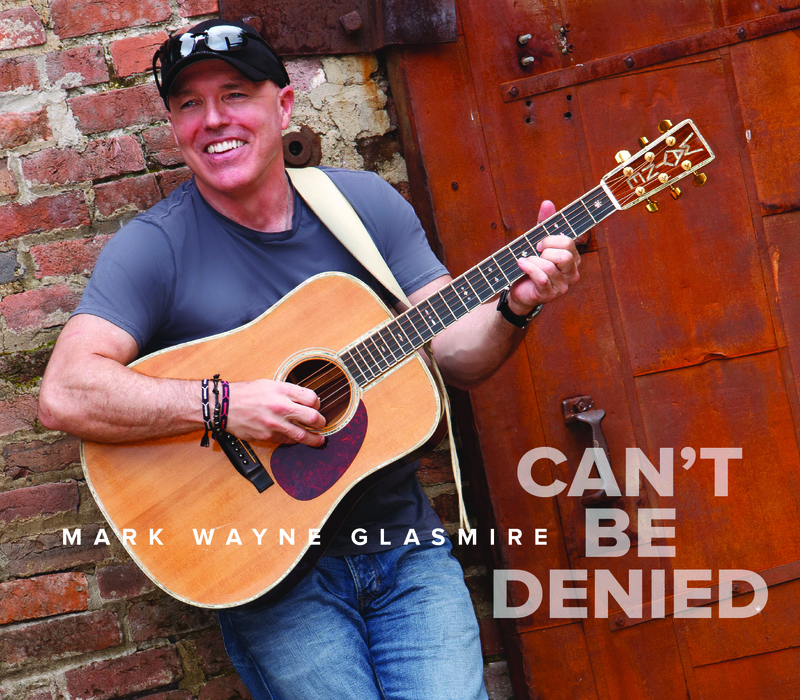 Texas Troubadour's CAN'T BE DENIED Offers "Unlimited Appeal"
Nashville, TN (October 12, 2018) -- Mark Wayne Glasmire's new CD, CAN'T BE DENIED, drops today. The award-winning singer/songwriter's latest 12-track offering, co-produced by Glasmire and John Albani (Steve Azar, Monty Holmes, Randy Boudreaux), can be purchased from Amazon and CD Baby. Mark's current single, "I've Got A Feeling" has just hit #1 on the International charts. The well-received companion music video is airing on The Country Network (TCN), the HOTDISC TOP 20 TV SHOW in HD, Sky TV Channel 376, "Keep It Country" and FreeSat. Since the release of his 2009 CD, LIFE GOES ON, Mark has enjoyed hits on the MusicRow Chart and earned international acclaim with a string of #1s. His "I Like You" spent nine weeks in 2012 at the top of the Hotdisc International Chart and solidified his global fan base. He has shared the stage with Gordon Lightfoot, Dierks Bentley, Guy Clark, Kathy Mattea, Tracy Chapman, Jessie Winchester, Al Stewart, Bruce Robison, Rick Vito, Verlon Thompson, Roger McQuinn, Tom Paxton, Suzanne Vega, John Gorka, and more. Glasmire has performed at venues ranging from the CMA Music Fest to intimate night clubs, and he has toured on the national level for years. He has taken home first place honors in the B.W. Stevenson Memorial Songwriting Competition in Dallas, the Dallas Songwriters Association International Songwriting Competition and the GINA/LAWIM Songwriting Competition in Los Angeles, as well as the Grand Prize in the Country Song division of the 2010 Chris Austin Songwriting Contest at Merlefest. The Bethlehem, Pennsylvania-born native now lives in Arlington, Texas. The concept-driven, dream-inspired JUST LIKE IN THE MOVIES. This 14-track package, produced by Catt Gravitt and Gerald O'Brien, mirrors the emotional and musical growth of Natalia, Hannah and Christina Morris, the three sisters from the Mississippi Delta who form SOUTHERN HALO. "Missing Mississippi," written by Natalia and Jennifer Adan, slows things down with the true tale of Natalia's first night in her new Nashville home. Sweet, reflective and emotional, the song shows that sacrifices are always made in pursuit of the dreams that inspire us. Another track that shines the light on leaving, "Famous" tells the tale of the loneliness that can surround stardom. Penned with Alex Dooley, the message is deep - and partially hidden by a seductive melody. "Tom Girl," written with Melissa Bollea Rowe, describes a character familiar to the Morris sisters: someone who loves to get their hands dirty, but also loves to dress up for special occasions. As Natalia says, "everyone talks about 'tom boys' or 'girly girls' - no one ever talks about 'tom girls.' Christina loves fishing while Hannah rides horses and I enjoy building projects in our backyard, but we love to get prettied up for a night out. We're all 'tom girls.'" Skip Cherryholmes, guitarist/vocalist and co-founder of Bluegrass band SIDELINE, will join host Jon Patch this Saturday, March 31, live on his Talkin’ Pets radio show. SIDELINE's dynamic first album for Mountain Home Music Company, FRONT AND CENTER, will be released April 27. Their current radio single, "Thunder Dan," is #1 on the Bluegrass Today Chart this week. The companion video is airing on The Country Network. Skip takes the lead vocal on the quiet contemplation of Gordon Lightfoot's "Song For A Winter's Night" with a masterful touch making it an album highlight. With no banjo, this quiet ballad creeps slowly into the heart as it captures the loneliness and soft, sweet sadness of a solitary winter's evening. The result is a solemn and reflective tune delivered with the contemplative longing of the original - as well as subsequent covers - which include versions by artists as diverse as Sarah McLachlan and Harry Belafonte. Gordon Lightfoot released “Song For A Winter’s Night” in 1967; Rice’s iconic recording hit the airwaves in 1986. A pedigreed six-piece powerhouse that has set the pace in Bluegrass for over two decades, SIDELINE was founded by Steve Dilling (banjo), Skip Cherryholmes (guitar) and Jason Moore (bass). The three have all made historical and significant contributions to the genre as members of highly-awarded groups, with multiple Grand Ole Opry appearances, and years of global touring behind them. What started as a side project for these seasoned players soon expanded as the core members were joined by Bailey Coe (guitar) and Troy Boone (mandolin). Newcomer Daniel Greeson replaced longtime band member Nathan Aldridge on fiddle in 2018. With songs that range from pulse-pounding barn burners to those sung from the heart, this sextet brings perfected timing and dynamic - as well as visceral emotion - to their music. With three previous successful album releases, audiences have found that whether live or recorded, the group moves easily from well-chosen, neo-traditional covers to new material curated with a holistic sense of identity and mission. Add their on-stage energy and powerful harmonies to the mix, and you have the best of the revered Carolina 'Grass sound. -Pet Acoustics calms anxious pets with holiday music specially composed in frequencies pets like best. (Washington Depot, Conn.) November 17, 2016- The holidays are not just a stressful time for owners, it can be a very anxious time for pets as well: new places, new people and new sounds. Music has the power to heal, relax and comfort during times of stress, but our pets hear in different frequencies than we do. Janet Marlow, sound behaviorist and Founder and CEO of Pet Acoustics, Inc. is proud to offer a solution for stressed pets this holiday season, through Pet Acoustics Holiday Music for use with Pet Tunes pre-loaded Bluetooth® speakers. This collection of music provides pets and pet parents a gentle and calm atmosphere during the holiday season and is proven to alleviate anxious behaviors in dogs and cats. Original holiday orchestrations, composed by Marlow are designed with species-specific hearing sensitivities in mind. High frequencies and jarring volumes are agitating to dogs and cats for example and have therefore been eliminated from the music. Pet Acoustics offers two options for pet owners: the Pet Tunes mobile Bluetooth® speaker, pre-loaded with soothing music and Holiday Music CD and chip or the Ultra Calmer canine stress relief sonic collar for on the go pets. The speaker is great for pets staying home that may experience separation anxiety or noise phobias, while the sonic collar is great to have while in the car or on board a plane. To learn more about Janet Marlow and Pet Acoustics or to sample the music, visit www.petacoustics.com. About Pet Acoustics, Inc. Pet Acoustics, Inc. is a leader in the field of sonic environments and how sound affects pet behavior. Our innovative products are species-specific, based on pet hearing ranges. Pet Acoustics has helped thousands of pets with separation anxiety, thunderstorm nerves and with enrichment activities. Our breakthrough research provides pet owners with unique products in the pet wellness market. To learn more and listen to sample tracks, visit http://www.petacoustics.com/. Popular Kentucky Bluegrass band NewTown lead singers Kati Penn and Jr. Williams will join host Jon Patch this Saturday, September 24, live on his Talkin’ Pets radio show. They are promoting their newest CD, HARLAN ROAD (Mountain Home Music Company), which is filled with tales of the "everyman," and is available for purchase from iTunes, Amazon and other retail outlets. The CD debuted at #8 on the Billboard Top 10 Bluegrass Albums Chart in late July, and the critically-acclaimed disc’s “All That I Can Take” made its Bluegrass Today Weekly Chart debut that same week at #6. The CD is holding the #23 spot on the Roots Music Report Top 50 Bluegrass Album Chart this week. The group continues a busy touring schedule with dates in Kentucky, Indiana and Illinois and performances at the IBMA World of Bluegrass celebration in Raleigh next week. A stand-out in any genre, NewTown features the vocal magic of award-winning fiddler Kati Penn and her husband, Jr. Williams, a dynamic banjo player. Travis Anderson (bass), Mitchell Cannon (mandolin) and Hayes Griffin (guitar) bring energy, far-ranging talents and Bluegrass, Jazz and Contemporary influences to the group. NewTown joinedCarrie Underwood, Chris Young, Brett Eldredge and other luminaries for the September 5 launch of NASHVILLE INSIDER, a new, 30-minute entertainment series.The show debutedin well over 100 MILLION households viaHeartland TV, The Family Channel, AMG TV, Angel Two/Dish TV, Keep It Country (UK) and Country TV (New Zealand). "It was a very straightforward concept," explains Alexandra. "The entire focus was on showcasing the emotion and musical validity of the song in an organic way." For Demetree, returning to the basics was an exciting challenge. "To go back to square one and make an acoustic version of this dynamic, mid-tempo power ballad was just a fantastic experience." The single, produced by Bobby Huff (Reba, 3 Doors Down, Journey, Heart) and written by Mark and Cherie Oakley, is rising on the MusicRow CountryBreakout™ Chart, currentlysitting at # 60. "Outta My Head" delves into the reminders left behind when a relationship ends: the photos, the empty space beside the bed and more. It's a tale that most listeners can relate to, and it follows the petite brunette's three previous successful Country radio releases, including the popular single/video duet of her own composition, "Lay It On Me," with The Bachelorette's Wes Hayden. Demetree wraps a four-day radio promotion tour of Oklahoma today; the tour will resume in a few weeks. She continues to work on her upcoming EP. Fans can learn more about Alexandra from recent features at The Daily Country, Music News San Francisco, Digital Rodeo and One Stop Country. Alexandra's first performance, at the tender age of two, was singing Christmas carols for her Grandma's bridge group. Throughout her childhood, she sang in her church choir - in Latin. Music quickly became Demetree's passion and her life goal - to the extent that this true "Southerner," traveled all the way to Illinois to secure a degree from Northwestern University's prestigious musical theater program. With musical influences ranging from Motown, Celine Dion, LeAnn Rimes, David Nail, Garth Brooks, Adele and The Eli Young Band, it's no surprise that this native Floridian is an inspiring and energetic performer. Demetree has entertained crowds at Festivals, Fairs and venues ranging from New York's world-famous Carnegie Hall to stages in Cape Town, South Africa. She's performed for First Lady Barbara Bush, at Walt Disney World and at the Toyota Gator Bowl. She's opened for Andy Griggs and toured with singer/actor Wes Hayden. Alexandra has released three successful Country radio singles to date, including the popular single/video duet of her self-composed, "Lay It On Me," with The Bachelorette's Hayden. The singer/songwriter is most comfortable wearing jeans and cowboy boots. In her spare time, she enjoys creating Lebanese dishes, reading and traveling. Demetree supports The Children's Hospital at Oklahoma University Medical Center and resides in Oklahoma City with her family. Keep up with Alexandra online at http://www.alexandrademetree.com.